Prize(s): 1 win­ner will receive one (1) $100 Ama­zon Giftcard. I can't get the link to work. Buckling up is very important, my rule, the car doesn't start moving till everyone is buckled. I learned from the infograph that booster seat is needed between the ages of 8-12,I didn't know a 12 year old could fit in a booster seat. 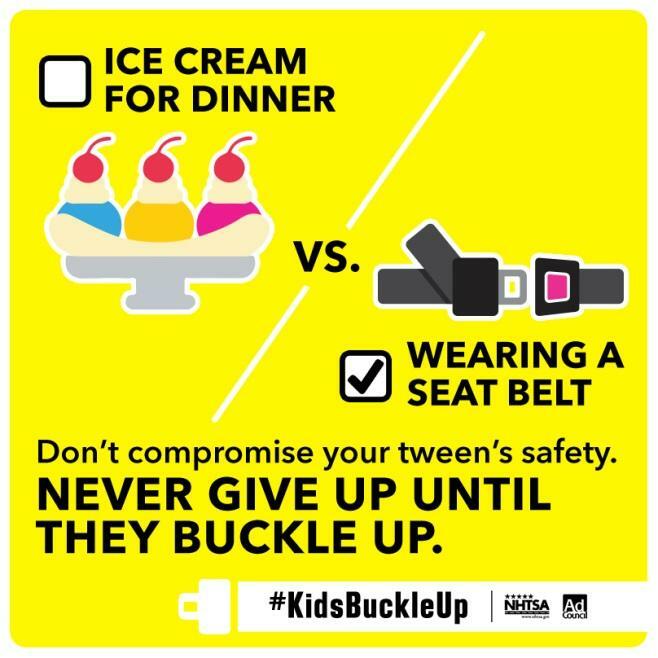 Though the link doesn't work, my trick for getting kids to buckle up is that I tell them the car doesn't move until the seat belts are on. I learned that in 2012, seat belt use in passenger vehicles saved an estimated 12,174 lives of occupants 5 and older.. I learned that in 2012, seat belt use in passenger vehicles saved an estimated 12,174 lives of occupants 5 and older. I learned you should never let a child put the shoulder belt under an arm or behind the back, because it could cause severe injuries in a crash. They may not like the feeling at first, but eventually they'll become accustomed to it. I thought for sure that every state had a seat belt law but they don't. I think that is just crazy. Thank you!! is able to keep his or her feet flat on the floor. 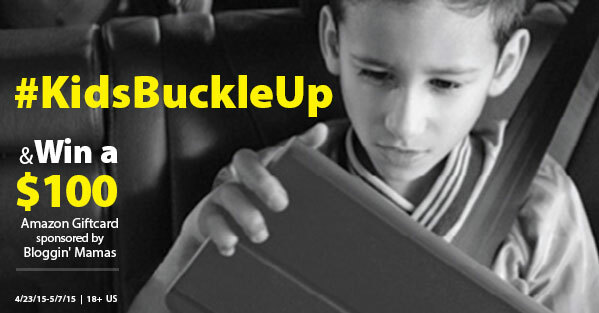 Visit SaferCar.gov/kidsbuckleup and tell us something you learned about buckling up. Follow these pointers—from setting the example by buckling up to making sure all children under 13 ride in the back seat—for maximum safety. Seat belt adjusters can help you get the best fit. Obviously, it can save lives. 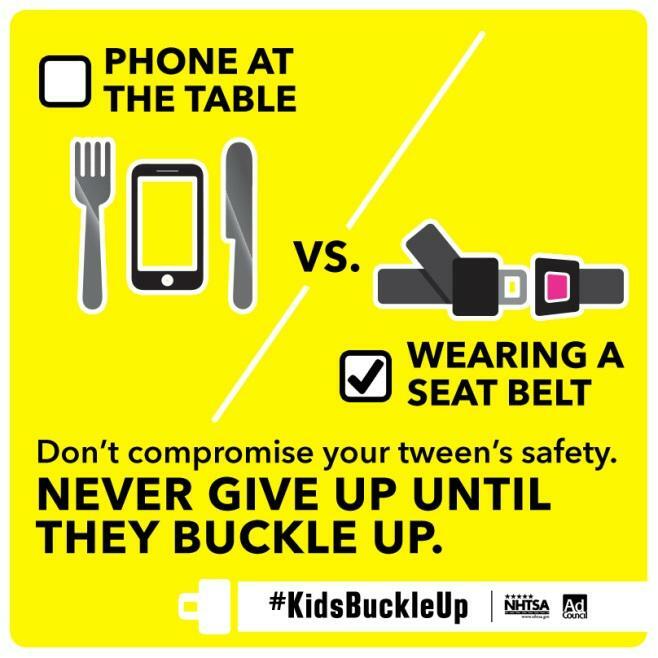 We are our teens' number one influence..If we buckle up every time, they are more likely to do the same! I learned you should never let a child put the shoulder belt under an arm or behind the back, because it could cause severe injuries in a crash. That it's safer for your child to be in in the back seat. Kids should always ride in the back! I did not realize that children need to be at least 13 before riding in the front seat. I didn't know that kids have been strangled by power windows! I learned that a booster seat is needed between the ages of 8-12. I learned children 13 and under should ride in the back seat. I would have never thought that! I learned that it's safer for kids to sit in the back seat. How come it ended early?